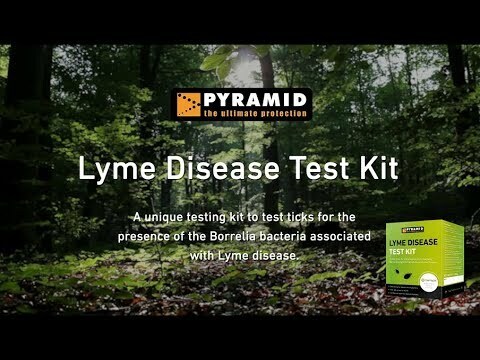 Suitable for use on humans and animals, our Lyme Disease Test Kit is a unique kit to test ticks for the presence of the Borellia bacteria associated with Lyme Disease. Results are provided within a maximum of four working days from receipt of the tick as an independent laboratory report, which can be shown to a medical or veterinary practitioner. Rapid, early treatment of Lyme disease is crucial to avoid the development of chronic, long term symptoms, however current medical testing is limited in early stage infections. Our kit is an invaluable aid in successful, rapid diagnosis. Purchase the kit. The kit contains tick removers, test tube, all return packaging and full instructions. Payment of the testing fee. This payment should only be made when you have found a tick and wish to send it for testing. It is recommended that payment is made immediately prior to the dispatch of the tick. The kit is available for sale through any of our stockists or from our webshop. The testing fee must be paid via our webshop, please click here to access the payment page. For copies of our instruction leaflet and a sample laboratory test certificate, please e mail testkit@pyramidtravelproducts.co.uk. Full instructions are supplied with each kit and should be referred to when using the product. Summary instructions are below for general guidance. Remove tick using the tools provided. Place the tick in the tube provided, push the lid on tightly and attach the label, detailing your name, email address and phone number. Place into the prepaid postage package and post immediately. Retain the label detailing your unique ID number. Visit our webshop here and make the payment for the testing fee. Test results will be returned via e mail, within a maxiumum of four working days. The send from e mail address is testkit@pyramidtravelproducts.co.uk. Please check any spam folders that you may have in case the e mail is allocated to this folder. An invaluable aid in obtaining rapid treatment. Laboratory results certificate, suitable for showing to a medical practitioner. Suitable for human and animal use. Is the kit a diagnosis of Lyme disease? No. The test is extremely accurate, however it is possible that you could have been bitten by an infected tick which subsequently detached unnoticed. A negative result makes it exceptionally unlikely that the tick tested could have conveyed the Borrelia bacteria, it is however possible that you could have been infected by another tick bite. Equally a positive test result does not automatically mean the person or animal affected will contract Lyme disease as the there are a number of factors which affect the likelihood of transmission. These include the length of time the tick was attached for and the length of time since it last fed. Tests are run twice per week on fixed days, therefore the time taken for the results to come through will depend on the day of the week the laboratory receive the results. The maximum time from dispatch of the results to receipt of the results will be four working days. How are the ticks tested? On receipt at our testing laboratory, tick dna will be extracted and purified in specialist containment facilities. It is then tested with a real time Polymerase Chain Reaction which specifically amplifes and simultaneously detects Borrelia DNA sequences. Borrelia bacteria are the cause of Lyme disease, and the positive identification of Borrelia DNA in a tick which has fed on a human or animal is a very significant indicator of risk which should be discussed with your medical or veterinary practitioner at the earliest opportunity. How do I access the results of my test? Test certificates will be sent via e mail from testkit@pyramidtravelproducts.co.uk in the form of a password protected pdf file. Pdf files are a globally accepted secure standard for dissemination of this type of information, and virtually all computers will automatically open the files. In the unlikely event that your computer will not open the pdf, please visit https://get.aldobe.com/uk/reader/ and download the free reader software. The password to open the pdf file is the unique code that was supplied in the test kit. Providing excellent protection for the face and neck, our Pop-Up Hat and Head Net is ideal for midge protection and for travellers visiting tropical areas. The unique design combines a midge-spec net with a pop-up hat that folds neatly into a carry bag. A wise addition to any kit list when exploring the Scottish Highlands and islands during midge season (roughly May to September), our Midge-spec Head Net offers welcome protection for the face and head. Equipped with extremely fine mesh and a toggled draw cord, the net is specifically designed to prevent midges and other tiny insects from getting inside. Handy carry/storage bag included. For added protection, see also our Pop-Up Hat and Head Net, plus Midge Jacket. For fast and effective relief from bites and stings using the soothing power of Aloe Vera, you can't go wrong with Bug Bite Relief. Now also available in a handy roll-on pen! Simple to use and pocket-sized, the pen allows for accurate and pin-pointed application onto the bite area. It's the perfect travel-sized companion for times when you forget to apply repellent. Bug Bite Relief cools the skin and helps to numb the pain associated with insect bites. The 60ml spray is also ideal for taking in hand luggage. Approximately 150 sprays per bottle.